After a long time of trying to work out why the site was running so slowly at times we realized that the shop plug-in we were using was the culprit. For some reason we just couldn’t upgrade this plug-in to the latest version as I kept messing up. So, we decided to use a different shop plug-in, Market Press from the guys WPMU, it’s a lot easier to use and a lot less “clunky” and now the site is running at a decent speed again. So what’s new in the shop, well over the next week I have quite few more rough rocks to add, so far we have weighed and measured 50 items including Denim Lapis Lazuli, Labradorite, Sodalite, Rose Quartz and Tiger Eye so these will be the first be added. We also have lots more Porcelain Jasper, sometimes known as Exotica Jasper, and a newcomer, Sorronan Moss Agate plus some others too. Following that our Cabochons will also be put on offer. There will also be various rough rock that we have put one polished face on, this could be used for display or cut up for Lapidary projects. The shop has been quite busy over the last month which is great considering the current economic climate and we do appreciate your support. 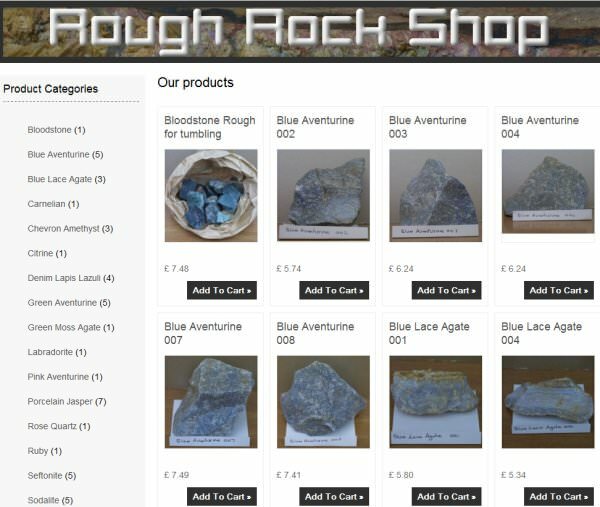 So why not step inside and have a browse around the new Rough Rock Shop , we would welcome your comments both good and bad thanks! we would be happy to slab some of this for you, our maximum cutting depth is approx 5cm so keep this in mind when sending some. We would like to keep a couple of slabs that we cut for you, no other charge other than you pay postage both ways, how does that sound. Hi, thanks for the advise ..have a tile saw tricky to use but does work, have improvised a grinder polisher but will be building a slab saw, let me know what stones you may be interested in as we may have a deal ? some of the Agate is washed down the river however I have found a spot where its coming out of the boulder clay…did not recognise the piece at first picked it up in case then cut it yep Island Agate…very dark? Work stops me getting to the Beach as often as I like but thank goodness for weekends? you are making us just that little bit jealous, living near the coast and being able to find nice stuff like you are, our best finds round here are pebbles and flint! Have you thought about a diamond tile saw for rocks that aren’t to thick, they work quite well and are readily available, as for a bigger diameter saw, it’s good to keep your eyes on ebay, that’s where we got ours a number of years ago, heaven knows how old it is but it still does the job for us. If you want to build one, again keep your eyes on ebay again and see if you get a good picador speed shaft, this should be a good basis for building a saw, or alternatively get yourself a length of stainless steel bar and a couple of self aligning sealed bearings and a stepped pulley and you should best part of the way there, you could get everything from ABC polishing and he will do the machining for you as well, good honest to deal with. The you would just need to make the resevior and saw table top and get a motor. If you want some stuff cut in the meantime let us know. Thanks for the reply…found my first largish piece of Agate ( island Agate)very dark but quite a lot of small pieces…I need a slab saw so looking to buy/build something….have found first piece of Amber fairly large so quite pleased with myself ? Beach finds best after a gale in the winter but high tides bring the goodies in…not quite as easy to spot as people think but it doesn,t take long to get the eye…hopefully see you at a show tdo you venture up north? congrats on finding your lump of amber, can’t pretend I am not envious, now in answer to your question, I did see an article once about a guy who does amber using wet and dry paper and washing up liquid if I remember rightly, I will have a poke around over the next few days to see if I can find it again and send you a link. thanks for dropping by and glad to hear you found my ramblings to be of interest. Yes regarding the equipment, unless you are loaded you have to learn to build or adapt to make your various machines but that’s half the fun of it and there is nothing like creating a nice piece in the knowledge that it’s all your own work and produced on your hand built machines, very satisfying.